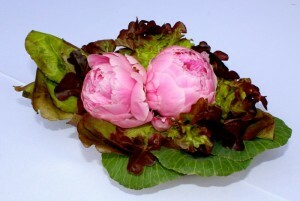 Peonies and red leaf lettuce make a lovely centerpiece. My son, Zan, married Lucy last week. Last week my first novel, SIMMER AND SMOKE, was attached a firm publication date: two weeks from today. (The paperback is now available on Amazon; the ebook will be soon.) Events surrounding the book’s massive to-do list were swept beneath wedding hoop-la without a glance. Big glorious times. This week the balloon has deflated, the to-do list resurrected. My brain feels cracked, like some errant mule kicked my head into nonsense and all I can report are that ribbons of young, uncooked chard are delicious in tossed salads (as reflected in today’s recipe) and wood chunks (rather than chips) make a long smoke easier. But you probably knew this anyway. 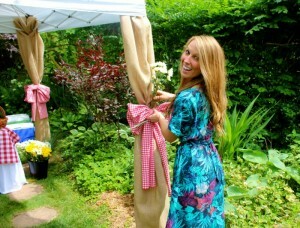 Greta wrapped the tent legs with burlap, tied them with gingham bows, then inserted fresh daisies into the bows. 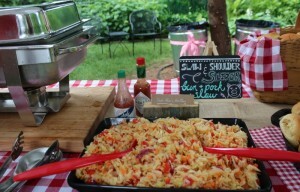 Backing up, my self-catered, pre-wedding party (menu found in the previous blog) for 65 guests was a success. A lesson learned decades ago: when entertaining, do as much as you possibly can in advance. For instance, pop-up tents were ordered to fit our backyard several months ago. (It was less expensive to buy then rent them.) Pinterest is an invaluable tool in storing decorating ideas. And who knew Joanne’s Fabrics is a Godsend for tent leg inspiration? After a week of non-stop rain, the son shone down on my boy and his bride, the fiddler fiddled, and our guests dined on heritage recipes that relatives long passed away had penned. Zan’s deceased grandmothers, amongst others, were celebrating this union with their recipes for potato salad and pimento cheese. How wonderful is that! Back to today’s recipe. Lucy once made me a tossed salad using ribbons of fresh, young, locally-grown chard; I loved the element of texture it lended to the salad and recreated something similar last night. It’s a riff on a Caesar Salad but I eliminated the egg in the dressing and substituted grated Gruyere for Parmesan. I also added some beets, avocado and pumpkin seeds I had on hand. I fear my riff has strayed quite a bit from the original tune, but your salad will be delicious, whichever chord you play. Have a lovely, safe Fourth of July. Here are some explosively delicious recipes that may inspire. Rub cut side garlic clove around interior of wooden salad bowl. With a fork, mash together garlic, anchovy, and mustard. Whisk in Worcestershire sauce, lemon juice and red wine vinegar. Slowly whisk in olive oil and continue whisking until emulsified. Taste and add additional freshly ground pepper, to taste. 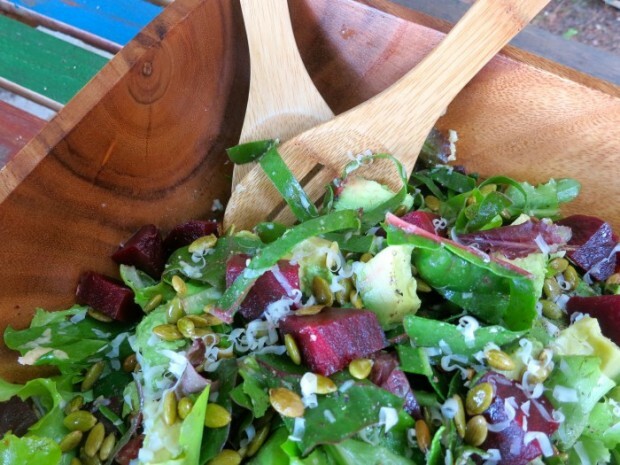 Toss lettuces, chard ribbons, beets, avocado and pumpkin seeds into dressing. Liberally season with Gruyere and serve. That salad looks fabulous! Thanks for sharing!